This traditional shepherd's pie recipe is easy, quick to prepare and makes enough to feed the whole family. Preheat the overn to 200C, gas mark 6. Heat the oil in a pan and saute the soffritto mix over a medium heat for 5 minutes until softened. Add the ground lamb, increase the heat and fry for 3-4 minutes, breaking up the meat as it browns. Add the Worcestershire sauce, tomato purée and stock, bring to the boil then simmer for 20 minutes, until the liquid has reduced and the mixture has thickened. Meanwhile, put the potatoes in a pan of cold water, bring to the boil and simmer for 20 minutes until tender. Drain, return to the pan and mash until smooth. Stir in the milk and season. Season the filling to taste and spoon into a 2.25-litre shallow ovenproof dish. Spoon the mashed potatoes evenly over the top and rough up the surface with a fork. Bake for 35-40 minutes until golden and bubbling. Add grated cheddar cheese to the mash and sprinkle some on top for more colour and texture. Using the ready to cook soffritto mix (diced onion, celery, carrot) will save you lots of preparation time. Monasterio de Santa Ana Monastrell 2006 Jumilla, Spain, is a full, rich and vibrant red wine with a soft finish. 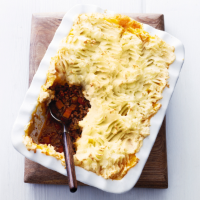 It's perfect with the comforting flavours and textures of shepherd's pie.